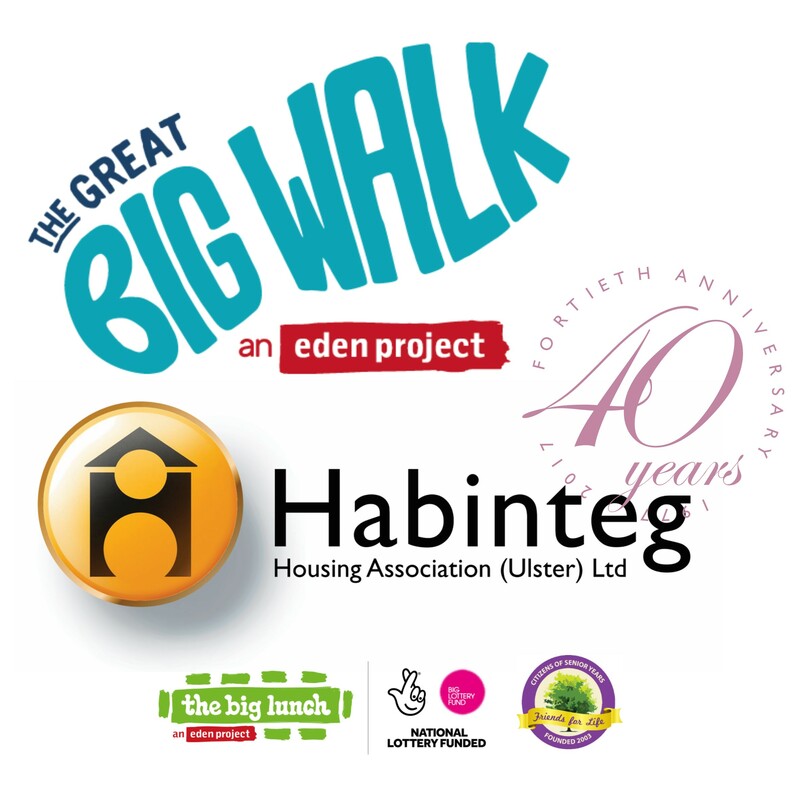 Hazelbank residents welcomed the Great Big Walk Team NI - Olivia Cosgrove and Noel Johnston - to their Farland Way street party on Thursday 8 June, as part of Habinteg Housing Association’s 40th Anniversary celebrations. Olivia and Noel are among five teams reaching the midway point on an epic trek, which began in Batley, England on 29 May and will reach its end on Sunday 18 June when the other teams simultaneously reach their destinations in Scotland, Wales, Cornwall and London. The start of this Eden Project event, funded by the National Lottery, was broadcast on the BBC’s The One Show with comedian Jo Brand sounding the claxon. It will culminate on Father’s Day, Sunday 18 June with a UK wide Big Lunch and Great Get Together on the first anniversary of the death of Jo Cox MP, whose friends and family were instrumental in organising this year’s events. The Great Big Walk Team joined the fun at Farland Way as one of their scheduled stops, to rest, refuel and shine a light on the great community work carried out in the area. “I am excited” said Olivia “about meeting people who are having an impact on their communities”. The Great Big Walkers are visiting towns and villages, meeting a diverse range of groups who go the extra mile for those around them. The Great Big Walk headed off from Hazelbank enroute to Strabane. The walkers said they will “carry the story to the next town…” and the experience “will feed the journey”.